After the hot-cross buns are all gobbled up, the Easter break is a great opportunity to check out TMAG’s three recently opened exhibitions. Within & Without presents a variety of artworks which focus on the internal self and the external environment through still life, domestic scenes and exteriors, and portraits. Regarding Landscape is an overview of the way artists have interpreted landscape. 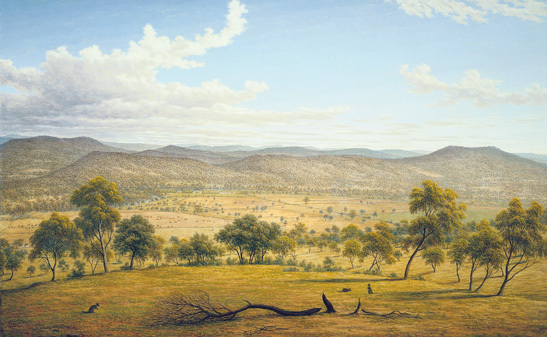 It features paintings by major Australian artists over a 170 year period. Works in both exhibitions are drawn from TMAG’s collection from Colonial through to contemporary periods, and TMAG’s volunteer art guides are hosting exhibition tours on Sundays at 2:00pm and Tuesdays at 12:15pm. Another recently opened exhibition provides a glimpse into Tasmanian holidays of the past though the archival holiday movies and travelogues on display in Isle of Many Waters, which was inspired by Frank Hurley’s 1939 film of the same name. Discovery Backpacks full of activities are also available for families to borrow, and will guide young visitors through TMAG’s permanent exhibitions Islands to Ice and Medals and Money. TMAG will be closed on Friday, 6 April for Good Friday, and normal opening hours of 10:00 am – 5:00 pm will resume from Saturday, 7 April, throughout the Easter period.